Habit: Cespitose, generally < 3 cm between branches; rosettes 1--16, 5--10(20) cm wide. Stem: 1.5--4.5 cm wide. Leaf: evergreen, 8--20 cm, 4--10 mm wide, +- cylindric except at base, lightly covered with thin, translucent wax, appearing olive-green, base +- wounding yellow, 1.5--3 cm wide, tip acute. Inflorescence: open, peduncle 10--50 cm, 3--10 mm wide; 1° branches several, branched 1--2 ×; terminal branches 4--10 cm, 3--11-flowered; pedicels 1--2 mm. Flower: sepals 2.5--4.5 mm, oblong-ovate; petals 7--10 mm, 2--3 mm wide, fused 1--2 mm, elliptic-oblong, acute, spreading or +- reflexed from middle, white-cream; styles 1--2 mm. Fruit: 45--60° < erect, strongly swollen at base. Chromosomes: 2n=34. Ecology: On soil, rocky slopes, ledges; Elevation: < 1300 m. Bioregional Distribution: SCo, PR; Distribution Outside California: northern Baja California. Flowering Time: May--Jul Note: Hybrids with Dudleya stolonifera, Dudleya blochmaniae suspected. 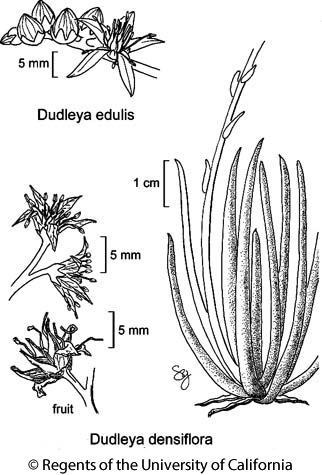 Citation for this treatment: Stephen Ward McCabe 2012, Dudleya edulis, in Jepson Flora Project (eds.) Jepson eFlora, http://ucjeps.berkeley.edu/eflora/eflora_display.php?tid=23654, accessed on April 25, 2019.